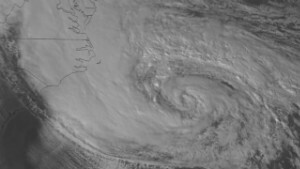 (CNN) -- As Hurricane Sandy pushes ashore with top wind speeds of 90 mph, the massive storm has already started walloping residents from Virginia to Massachusetts early Monday, hours before its center is expected to reach shore. The Category 1 hurricane's center is taking aim at southern New Jersey's shoreline and the Delmarva peninsula -- which gets its name from the three states that occupy parts of it: Delaware, Maryland and Virginia. Its center is expected to hit land as early as 8 p.m. ET Monday. Forecasters believe Sandy will collide with a cold front and spawn a "superstorm" that could generate flash floods, snowstorms and massive power outages along the Mid-Atlantic coastline, home to some 50 million people. Governors of the states affected are urging residents to take the threat seriously and make sure they are prepared for the worst. Hurricane-force winds -- stronger than 74 mph -- will pummel the coasts of Delaware, New Jersey and New York state, while tropical-storm-force winds between 39 and 73 mph will stretch from North Carolina all the way to Maine. Likely immediate impact: downed power lines and extensive power outages. Forecasters are warning that an "extremely dangerous storm surge" could hit around the same time as high tide, with the highest storm surge along the coasts of New Jersey, New York and Connecticut, especially where water funnels into New York Harbor and Long Island Sound. Immediate impact: coastal flooding and beach erosion. Heaviest rainfall of up to 8 to 12 inches will be likely on the Delmarva Peninsula and in New Jersey. Immediate impact: Cities such as Dover, Delaware; Baltimore, Washington and Philadelphia could see significant flash flooding. Extreme snowfalls totaling several feet will be likely in the Appalachian Mountains of West Virginia and to a lesser extent into portions of Pennsylvania and Virginia as well. With major airlines canceling many flights even ahead of the storm, air travel will be extremely difficult for all of the major Northeastern cities, from Washington through Boston both Monday and Tuesday. Impact: The ripple effect on air travel will be felt worldwide as flights arriving and departing will be canceled or severely delayed. Conditions will be deteriorating along the Mid-Atlantic into the Northeast through the day Monday. Landfall will occur Monday evening into overnight, and storm surge likely will peak around the evening high tide. (Remember Monday's tides are already the largest of the month due to the full moon.) On Tuesday, rain and snow will continue for much of the area, and surf will remain rough as the center of the system slowly drifts northward into Pennsylvania and New York. Because of the size of this system, the effects will be felt far from the center. For example, large waves and surge will be felt in eastern Canada and along the shores of the eastern Great Lakes. Also, when Sandy transitions from hurricane or tropical storm to "post-tropical storm," it does not mean it has weakened or the threat is any less.